The Cakes and Ale ritual is done after the Magick Circle has been Cast, the Deities invited,Offerings given and magick spells cast. Cakes and Ale is often glossed over as a mundane Earthing rite that signals the beginning of merry making. The real spiritual meaning is much, much, deeper and is often misunderstood or overlooked. Presumably you have invited the Lord and Lady into your Circle, given them offerings, prayers, and praise asking them to enter your Circle and aid you with your magick work. They are your guests, and the Cakes and Ale ritual is a way to honor Them and receive Their Blessings. When beginning the Cakes and Ale ritual, it is always wise to speak aloud your intention to begin the rite, so that all present realize that the ritual has shifted gears from the high energy work of making magick to the deep inner work of honoring the Gods. 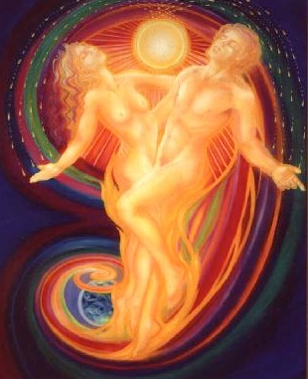 The first act is the physical and spiritual union of the Goddess and God. The Athame is lowered into the Ritual Cup. The Athame is the male God element and the Cup is the female Goddess element. The union of Athame and Chalice is the union of Goddess and God, symbolizing Their love for each other, the union of opposites, and fertility and procreation. This act of union consecrates the Ale and fills it with the Blessed energy of the Goddess and God. The Consecrated Ale is then used to Consecrate the cakes by applying drops of Ale onto the Cakes with the tip of the Athame. The magick of contagion, touching an unconsecrated thing with a consecrated thing, spreads the Consecration to the Cakes. The next step of the Cakes and Wine ritual involves setting aside a portion of both food and drink for the Gods BEFORE you partake of them yourself. The reason for this is simple; you have invited the Goddess and God into your Circle as honored guests. It is very impolite to eat and drink before your guests and then offer them the left-overs. It also implies that there may not be enough to go around, which brings the image of poverty and greed into the Circle. Once the offering to the Gods has been made, it is time for the group to partake of the Blessings created by the Sacred Union of the Goddess and God. When we eat and drink the Consecrated Cakes and Ale, we take within ourselves the essence of the Gods and receive their Blessings. Their Spirit enters our bodies. It is a holy communion, in which we consume the love, fertility and union of the Goddess and God. We consume the life force of nature and the universe. The ritual of Cakes and Ale is the most holy of Wiccan rituals, it is the Sacred Marriage of the Goddess and God which brings forth Their Blessings of love and life to all who drink and eat.